Family-friendly destination ready to prevent millions of vacations days from going to waste. PIGEON FORGE, Tennessee (Jan. 30, 2019)—According to the latest research*, 705 million vacation days go unused annually in the U.S. The city of Pigeon Forge (Tennessee) has several new reasons for workers to spend those hard-earned vacation days in the family-friendly destination located in the Great Smoky Mountains. Pigeon Forge always delivers on the promise of something new for visitors to see and do each year, and 2019 is no exception. The new Rocky Top Mountain Coaster sits on more than 20 acres and takes riders on a nine-minute journey that traverses multiple 360-degree turns, four tunnels, thrilling curves, and daring hairpin turns, all propelled by four uplifts and four drops, allowing it to reach a maximum speed of 30 miles per hour. Able to accommodate riders as young as three years of age (with minimum height requirement), it is another family attraction. The 200-foot-tall Mountain Monster three-in-one thrill ride anchors the Tower Shops at Mountain Mile, a 180,000-square-foot multi-purpose retail, dining and family entertainment development that spans 174 acres. Mountain Monster, opening this summer, will offer guests a drop ride, a dive ride and a swing, all in one attraction. MountainMilePigeonForge.com. Uncle Lem’s Outfitters, a soon-to-open 4,580-square-foot retail space, supports and encourages a love of the great outdoors by supplying enthusiasts with the necessary gear. Uncle Lem’s takes advantage of the area’s natural setting and plans to offer the services of hiking, fishing, bicycling, and outdoor adventure guides. It will open with paddle board and kayak rentals with bicycle rentals to follow. Pirates Voyage Dinner & Show, a Dolly Parton Company, will be located adjacent to The Island in Pigeon Forge in a 21,000-square-foot arena. Crimson and Sapphire pirates battle on deck, in the water, and in the sky above their full-sized ships in a 15-foot-deep indoor lagoon. The show also includes a four-course pirate feast. Pigeon Forge offers more than 14,500 overnight accommodations, ranging from hotels and condos to cabins and campgrounds. Joining the lineup this year are the 200-room Ramsey Hotel & Convention Center; the 108-room Fairfield Inn & Suites; and the 102-room Tru by Hilton. For more information about what’s new for 2019 as well as existing favorites, please visit MyPigeonForge.com or call 1-800-251-9100. *Research from the U.S. Travel Association’s ProjectTimeOff.com. Pigeon Forge is located in East Tennessee, approximately 35 miles from Knoxville and McGhee-Tyson Airport. Two-thirds of the nation’s population east of the Mississippi River lives within a day’s drive, making it an easily accessible family vacation destination. The city’s neighbor is Great Smoky Mountains National Park, the most-visited national park in the U.S. It also is home to Dolly Parton’s Dollywood theme park, Tennessee’s most-visited ticketed attraction. More information about all aspects of Pigeon Forge are available at MyPigeonForge.com or toll-free at 1-800-251-9100. PIGEON FORGE, Tenn. (August 22, 2017) — Anyone, at any age, can fall victim to a scam. However, con artists most often set their sights on older adults. Seniors in the U.S. are swindled out of an estimated $37 billion per year, according to a report by True Link Financial, mainly through financial exploitation, criminal fraud and caregiver abuse. In an effort to call attention to fraud that particularly targets older adults, Alcatraz East Crime Museum has collaborated with AARP Foundation on a temporary exhibit to help seniors recognize, refuse and report scams. Created by AARP Foundation’s fraud experts and hosted by Alcatraz East, the year-long exhibit, “Scamalot: Conquering the Con,” opens September 21, 2017. Visitors will encounter fraud in its various forms, including impostor scams, investment fraud and lottery scams. The exhibit will also feature stories of notable fraudsters, such as Charles Ponzi, and information on how the public can protect themselves from scams. IRS scams, in which a caller posing as an Internal Revenue Service agent threatens the victim with arrest if they don’t pay. Tech support scams, in which fraudsters gain access to personal information by offering to “fix” a nonexistent computer virus. Among the exhibit’s features will be objects related to infamous fraudsters Bernie Madoff, Lou Pearlman and David Hampton. Visitors will also be able to test their scam spotting skills through interactive displays. Alcatraz East officially opened December 16, 2016. The new crime museum is located at the entrance to The Island, at 2757 Parkway in Pigeon Forge, near the Margaritaville Hotel and Paula Deen’s Family Kitchen. The museum offers a wide array of exhibits on notorious crimes, law enforcement, and CSI, with historic artifacts and interactives. The Bronco from the famous OJ Simpson chase is currently on display at the museum, along with displays on the Unabomber, Ted Bundy, and Whitey Bulger. The museum is open 365 days a year, from 10 a.m. to 9 p.m., with the last ticket sold 60 minutes before closing. For more information and to purchase tickets, visit www.alcatrazeast.com. Alcatraz East is the most arresting crime museum in the United States. Guests of all ages can encounter a unique journey into the history of American crime, crime solving, and our justice system. Through interactive exhibits and original artifacts, Alcatraz East is an entertaining and educational experience for all ages — so much fun it’s a crime! This family attraction is located at the entrance of The Island, located at 2757 Parkway, Pigeon Forge, Tenn. For more information, visit www.alcatrazeast.com. AARP Foundation works to increase economic opportunity and social connections that help prevent and reduce senior poverty. We collaborate with individuals and organizations who share our commitment to innovation and our passion for problem-solving. Supported by vigorous legal advocacy, we create and advance effective solutions that help struggling older adults transform their lives. AARP Foundation is the affiliated charity of AARP. Learn more at www.aarpfoundation.org. PIGEON FORGE, Tennessee (July 2017) –Those living in and visiting the Gatlinburg/Pigeon Forge, Tennessee area will find a wide range of rare crime and law enforcement artifacts on display at the new Alcatraz East Crime Museum. The variety of objects on display offer an up close and personal look at the stories of some of the most notorious people and crimes in American and Tennessee history, located practically in your own backyard. The museum is the home to artifacts, which include firearms, CSI equipment, prison art, and automobiles, come from hundreds of justice and law enforcement divisions nationwide, including several from the state of Tennessee. This includes Tennessee police badges, the polygraph machine used on Martin Luther King Jr. assassin James Earl Ray, items belonging to outlaw Jesse James, confiscated moonshine stills, a display on Dr. William M. Bass of the Body Farm, and the museum’s newest addition, the original CBC (super glue) machine and patent, designed to lift fingerprints from bodies, invented by Sevier County native Arthur M. Bohanan. One of the centerpieces of the new museum is Tennessee’s electric chair, “Old Smokey,” that was used in 125 executions from 1916-1960. Additionally, the museum features numerous Tennessee stories, such as the Scopes Monkey Trial, legendary lawman Sheriff Buford Pusser, Machine Gun Kelly’s Memphis capture, local presidents Andrew Jackson and Andrew Johnson, and the shootings in Chattanooga. The collection also includes prison art from the Tennessee State Prison, leatherwork from the Brushy Mountain State Prison, a Sevier County Sheriff’s Office patrol car, and a Pigeon Forge Police uniform. There are also rotating temporary exhibits, currently including one on wildlife trafficking, which explores how species, including local black bears, are affected by poaching and what citizens can do to help address the problem. Alcatraz East officially joined the ranks of fun and family friendly Sevier County options on December 16, 2016. The new crime museum is located at the entrance to The Island, at 2757 Parkway in Pigeon Forge, near the Margaritaville Hotel and Paula Deen’s Family Kitchen. Guests can also enjoy free parking available at The Island during their visit. The museum has a star-studded panel of experts who make up the Advisory Board, including those in law enforcement, collectors, a medical examiner, crime scene investigators, and others. The board includes Jim Willett, a retired prison warden, Anthony Rivera, a combat veteran and Navy SEAL chief, and Judge Belvin Perry, Jr., who is best known for the Casey Anthony trial. General admission tickets are $14.95 for children, $24.95 for adults. Group ticket sales are available. The museum is open daily from 10 am to 9 pm, with the last ticket sold 60 minutes before closing. For more information and to purchase tickets, visit: www.alcatrazeast.com. Alcatraz East is the most arresting crime museum in the United States. Guests of all ages can encounter a unique journey into the history of American crime, crime solving, and our justice system. Through interactive exhibits and original artifacts, Alcatraz East is an entertaining and educational experience for all ages – so much fun it’s a crime! This family attraction is located at the entrance of The Island, located at 2757 Parkway, Pigeon Forge, TN. For more information, visit www.alcatrazeast.com. PIGEON FORGE, Tenn. (Oct. 5, 2016)—Draped in more than five million lights, Pigeon Forge creates a winter wonderland for guests to enjoy during the city’s annual Winterfest celebration (Nov. 8-Feb. 28). Located in the foothills of the Great Smoky Mountains in East Tennessee, the family friendly destination brings new meaning to sparkle, twinkle and glow as colorful light displays depicting popular characters and playful scenes illuminate the city’s six-lane Parkway from one end to the other. The Island in Pigeon Forge unveils $1.5 million in new Christmas experiences for guests. All-new decorations are showcased throughout the 23-acre property, including approximately 40,000 ornaments, half a million lights and more than 5,000 feet of garland. Guests are treated to three new Christmas trees, including one that stands 40 feet tall and allows guests to walk through. Santa and Mrs. Claus greet guests at their new workshop while roving carolers fill the air with Christmas music. Paula Deen presides over The Island’s annual tree lighting ceremony on Saturday, Nov. 26, at 6 p.m. There is no admission fee to enjoy the Christmas décor. Dollywood recently announced the $2.5 million addition of Dolly’s Parade of Many Colors, featuring new floats, specialty characters and songs. The park also adds a new show to its entertainment lineup with the stage production It’s a Wonderful Life. Both are part of Dollywood’s award-winning Smoky Mountain Christmas festival (Nov. 5-Jan. 1, 2017). Dolly Parton’s Lumberjack Adventure Dinner & Show puts a new spin on the holidays with an all-new Christmas show. This year, it is Christmas in Timber Ridge and the competition is on to see which lumber camp family is the best at growing and supplying the best Christmas trees in all the land. A cast of lumberjacks, “lumberjills” and “lumberjacrobats” bring this fast-paced, high-energy Christmas spectacular to life. A show-stopping Nativity scene, set to the sounds of Dolly’s own recording of The Little Drummer Boy, celebrates the true meaning of Christmas. The Titanic Attraction’s fourth annual Thanksgiving fireworks spectacular on Thursday, Nov. 24, at 7 p.m. Festivities also include a whimsical parade of costumed steampunk revelers. The Inn at Christmas Place welcomes Gerald Charles Dickens, great-great-grandson of literary master Charles Dickens, on Nov. 6-8. In his seventh year at the property, Dickens performs his one-man enactment of A Christmas Carol. New for 2016, Inn at Christmas Place offers afternoon tea featuring A Child’s Journey with Dickens on Sunday, Nov. 6, at 3 p.m. Details about all aspects of Winterfest are available at www.mypigeonforge.com. PIGEON FORGE, Tenn. (Oct. 11, 2016) Pigeon Forge firefighters and their families enjoyed a sunny afternoon at Margaritaville Island Hotel’s Roof Top Pool Sunday. Firefighters and their families were treated to an all-American cookout, games for the kids, magic tricks and live music by Chad McWilliams. 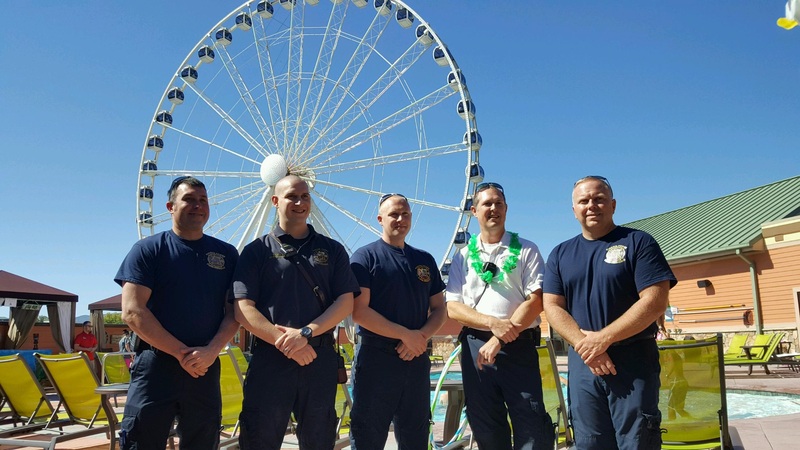 ”We just wanted to take this opportunity to thank the firefighters for helping us this summer and for everything they do for our community all year,” said Margaritaville Island Hotel General Manager Kristine Harmon. Many local community partners contributed time and gifts to help make this event a success. Doc’s Magic Shop amazed children and adults alike with magic. McKenzie Farmer, a certified lifeguard, watched over the pool. The Arcade and the The Sweet Shoppe on The Island donated prizes, and Jenny Pink donated her time and artistic talents by offering face painting. And, although the weather was a bit cool, firefighters did enjoy swimming with their children in the hotel’s heated pool. “We had a good turnout and are so glad everyone seemed to have a great chance to relax and enjoy a fun afternoon with the family,” said Lori Lee Rouse, Margaritaville Island Hotel’s concierge who coordinated all of the children’s games and activities. Margaritaville Island Hotel is located on The Island and offers 134 guest rooms and suites, balconies overlooking the river, village and Island Show Fountains, Changes in Latitude’s Bar which is open to the public, a Roof Top Pool & Chill Bar and the St. Somewhere Spa. The spa is also open to the public and offers complimentary valet parking and local discounts for Sevier County residents. For more information, visit the hotel website www.margaritavilleislandhotel.com or call 865-774-2300.